Update: The Get Windows 10 app now recognizes the GTX 980 Ti and allows me to reserve my copy of Windows 10. If you run into similar issues, Nvidia representatives suggested trying the steps outlined in the first answer to this Microsoft support query. 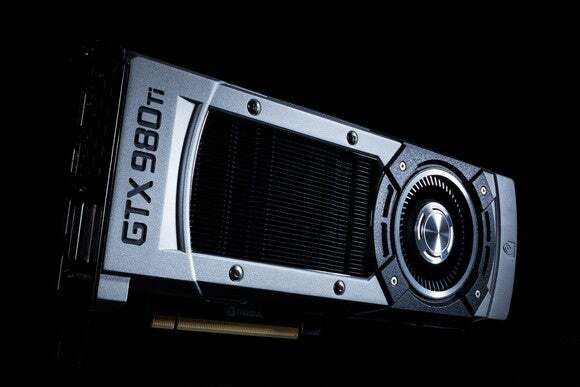 If you’ve purchased a ferocious Nvidia GeForce GTX 980 Ti graphics card, there’s a good chance you enjoy living on the bleeding edge of technology. 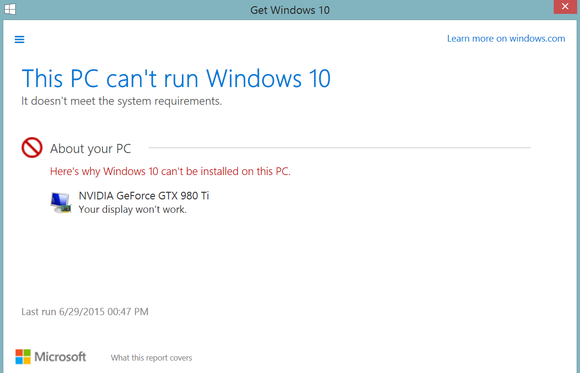 That’s why an issue that’s preventing GTX 980 Ti owners from reserving a copy of Windows 10 hurts so deeply. This morning, I tried reserving a copy of Windows 10 on a system that packs a GTX 980 Ti and, to my surprise, found that it wouldn’t show the usual “Reserve your upgrade” or “How this free upgrade works” options. Digging into the “Check your PC” portion of the app revealed why: Windows 10's upgrade app apparently doesn’t recognize the graphics card—even though the 980 Ti is one of the first GPUs to support DirectX 12’s 12.1 feature level. Bummer. Super mega major bummer. Digging a little deeper revealed a several other GTX 980 Ti owners suffering from the same problem. Update: Here's a quick message from an Nvidia employee on Twitter, though it's important to stress that his comments are personal opinions and not an official Nvidia statement—but it's still worth noting. I have a request for official comment in to both Nvidia and Microsoft. @killyourfm @BradChacos Advisor issue. Long story short, 980 Ti owners will have no prob on 7/29 & have an incredible Win10 experience. 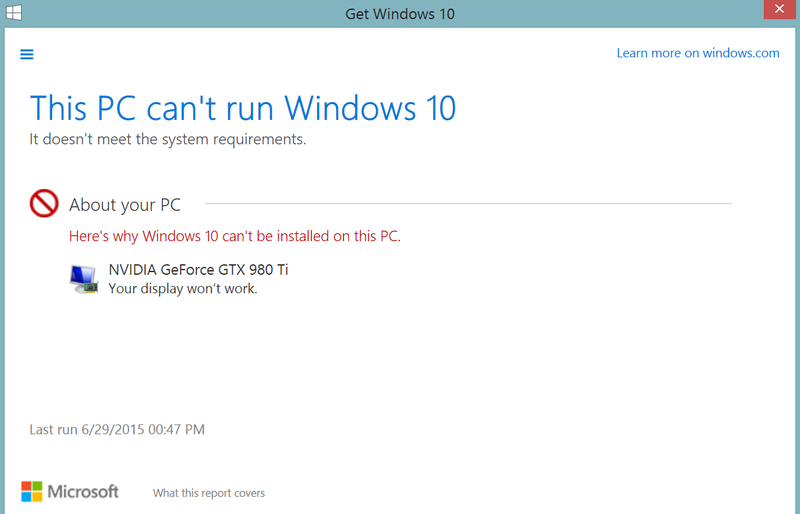 Either way, the error is preventing GTX 980 Ti owners from reserving a Windows 10 upgrade right now. Here’s hoping it gets fixed sooner rather than later. But if you’re impatient, this Reddit post offers a technical workaround—which I haven’t personally tested—that can supposedly force Windows 10 into accepting your hardware right now. You could probably just yank the card out of your system and run integrated graphics for as long as it takes you to reserve your copy, as well. Editor's note: This article was originally published at 8:30 A.M. E.T. but was updated at 12:10 P.M with the personal comment from the Nvidia employee.